Bishop of Jabalpur Diocese, Church of North India since 2004; Deputy Moderator of Church of North India since 2014. Under his able leadership as Bishop of Jabalpur Diocese, CNI, many magnificent projects have been successfully completed including several new institutions. His generosity and geniality are most encouraging. His vision and leadership is a widely acknowledged as exemplary and inspiring. General Secretary of Church of South India; President of United Theological College, Bangalore: Professor of New Testament at Karnataka Theological College, Mangalore. This quadrennial is a pilgrimage of learning justice and peace so that we may understand the necessity of becoming inclusive communities where the weak and the marginalized receive special attention and care. Member of the Executive Council of the Malankara Marthoma Church; Coordinator of the Pain and Palliative Care Centre run by the Church in Kerala. In the Present scenario, as Christians, we all have to join hands together to work for the unity of churches, and uphold the values and morals for the Glory of God. Thus we can form a community which is inclusive and just. I believe that we are at a stage in India where the churches and their youth must stand together with the Dalits, Adivasis and other marginalized communities to create a just, inclusive and secular state. Executive Secretary of the United Evangelical Lutheran Churches in India (UELCI); Held the post of Treasurer of National Council of Churches in India (NCCI) in the quadrennial 2012 – 2016. The man behind several new innovations in the UELCI; Successfully guided NCCI’s finances towards greater stability; His quiet but strong support are indeed a source of blessing. 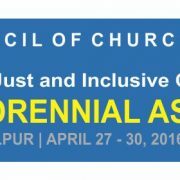 General Secretary of National Council of Churches in India since 2011; Belongs to Presbyterian Church of India. A Theologian, and academician and an Ecumenist, he came to NCCI with a wealth of experience from his long tenure with Aizawl Theological College in Mizoram, and Senate Centre for Extension and Pastoral Theological Research (SCEPTRE) in Kolkata; An unassuming personality and strong principles have ensured his continuing strength to serve admirably. The Installation of the office bearers will take place in the course of the concluding worship service scheduled to be held in Christ Church Cathedral on April 30, 2016 at 5:00 pm.